Minerals, which have been selling at peak EVE ISK prices in the past few months, are now becoming cheaper and RMT sellers need to act fast or risk losing profit. RMT sellers sitting on large stocks of minerals face a crucial decision: Unload now before prices dip lower, or hold on to their stocks and wait for inflation to rebound to sell at a high. 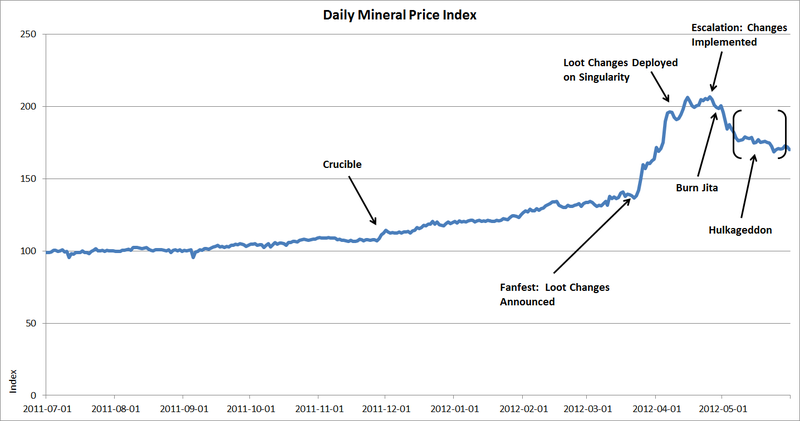 Two in-game events have driven mineral prices down in a span of two months, as seen in the chart above. First was the deployment of loot changes on Singularity. The patch raised the Tech 1 ship prices and, consequently, the prices of minerals needed to manufacture them. This developer post elaborates more on this price-pumping effect. Second was the Burn Jita event, a CCP-sanctioned raid on the famous trading hub of Jita. Around 14,000 ships from the Goonswarm alliance obliterated the enterprises there in a coordinated assault. "The people they're going to hurt now are people who have quite a lot of security," said lead game designer Kristoffer Touborg in an interview with Eurogamer, on why they allowed the Goonswarm to wreck a big portion of the game's economy. "There's not a lot of turnaround on ships and goods in Empire. I think it might be healthy if we lose a lot of this industrial power, if they have to go back and save up for their ships again and be a part of the cycle of life everyone else is a part of," he added. "Mineral prices actually started falling sharply after the release of Escalation and fell even more sharply following the burning of Jita.Â This is where the bubble of speculation and manipulation burst, as owners of mineral stocks cashed in," said CCP in its dev post. Mineral prices could have fallen more, but then came the Hulkageddon event, a month-long destruction spree of mining vessels in EVE Online. The result? The supply of minerals deteriorated, and kept prices at a level pace. 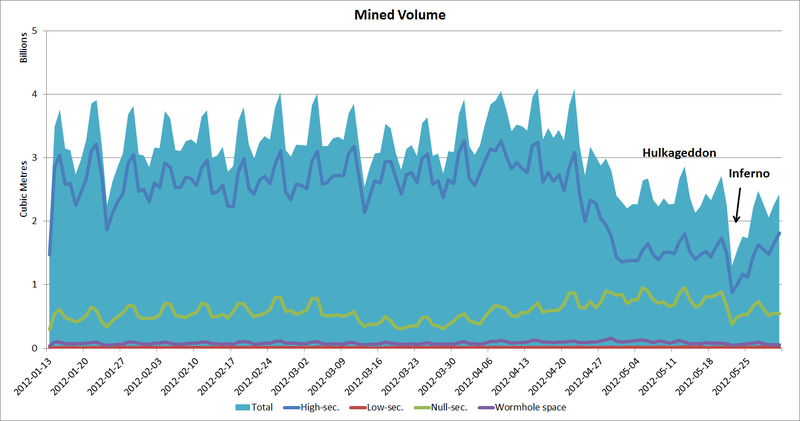 The chart below shows mined volume plummeting after Hulkageddon. But now that the event is over, mining vessels will proliferate again and begin flooding the market with minerals. This sudden onset of supply will bring down mineral prices, possibly even to the 150 index levels. RMT companies with mineral farming operations are then advised to sell their stocks now, as well as begin looking out for cheap minerals to purchase on a bargain.